This stromboli recipe is tender dough stuffed with tomato sauce, cheese and Italian meats, then baked to golden brown perfection. It’s a quick and easy dinner that’s ready in just 30 minutes! My family devours anything that’s pizza flavored, like pizza dip, pizza muffins and this amazingly delicious Italian stromboli. 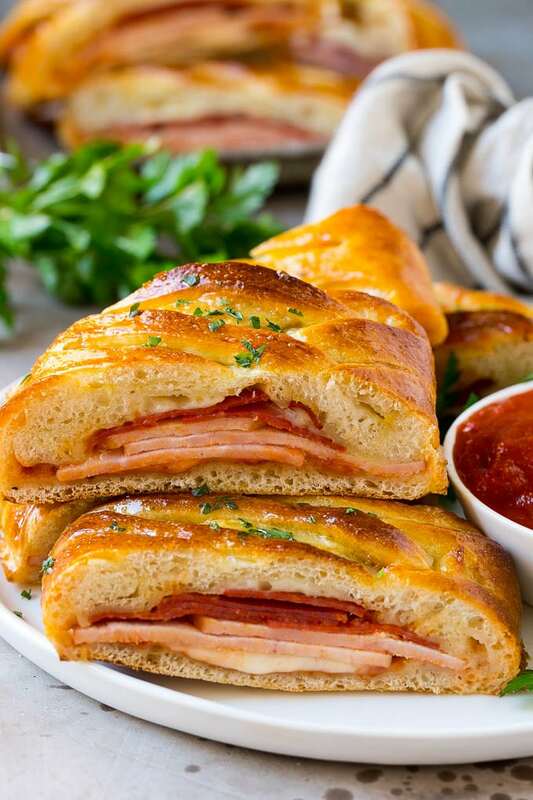 A stromboli is a super versatile meal option that can be filled with so many different ingredients! When I’m looking for a fast dinner for the family, I often turn to homemade pizza. My kids would eat pizza every day if I let them! In an effort to switch things up a bit, I took the pizza concept and rolled it up – into a stromboli! This easy stromboli recipe is pizza dough that’s filled with meats and cheese, then rolled into a loaf and baked. It’s a fun dinner that’s a cinch to put together and is most definitely kid approved! A stromboli is like a cross between a sandwich and pizza. It’s made with either bread dough or pizza dough that’s folded around meats, cheeses or vegetables then baked. A stromboli is served by cutting it into slices and can easily feed a crowd. How do you make stromboli? This stromboli recipe starts with the dough. I recommend using store bought pizza dough to same time, you can choose your favorite brand. I prefer to use the kind that comes in a tube for this recipe because it’s already in a rectangle shape when you unroll it. There are two ways to make your stromboli loaf. 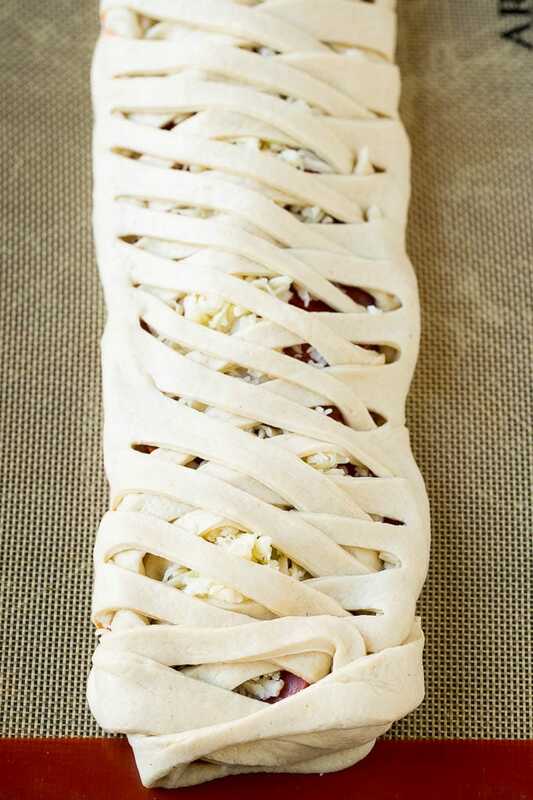 You can simply roll it up and seal the ends, or you can fold strips of dough over the top to make a pretty braided type pattern. It’s actually really easy to make the pattern, just use a pizza cutter to make strips of dough along the edges, wrap it, and bake! 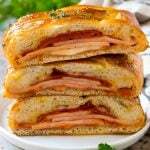 I fill my stromboli with marinara sauce, mozzarella cheese, ham and pepperoni, then wrap it all up! The top of the dough gets brushed with an egg wash to ensure a shiny brown crust. After the stromboli comes out of the oven, simply slice and serve! You can fill your stromboli with any toppings you like such as cooked sausage, mushrooms, bell peppers or olives. Make sure your veggies are pre-cooked before you put them in the dough. You can assemble your stromboli up to 6 hours before you plan to bake it. Store it loosely covered in the fridge until it’s time for dinner. Stromboli is great for dinner, but it’s also a fun party snack! Cut it into thin slices and serve it with a side of marinara sauce for dipping. What is the difference between stromboli and calzone? Both a stromboli and a calzone are made with pizza dough folded around meats, cheeses or vegetables, but a stromboli is log shaped and a calzone is often triangle or semicircle shaped. My whole family loved this meal – it’s full of classic flavors served in a fun way. This stromboli recipe is most definitely going into our permanent dinner rotation! This stromboli recipe is tender dough stuffed with tomato sauce, cheese and Italian meats, then baked to golden brown perfection. It's a quick and easy dinner that's ready in just 30 minutes! 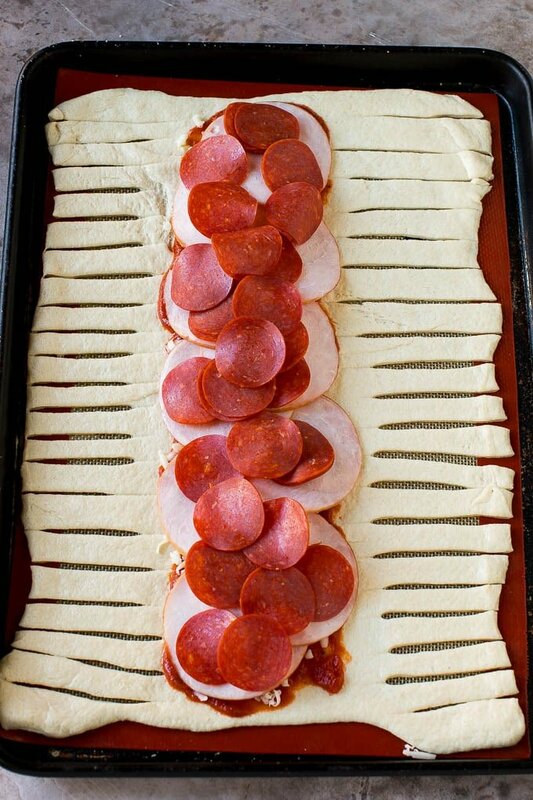 Roll the pizza dough into a rectangle that covers the area of the sheet pan, leaving a 1 inch border on all sides. Place the marinara sauce, 1/2 of the cheese, ham and pepperoni down the middle of the dough. Add the remaining cheese on top of the meats. 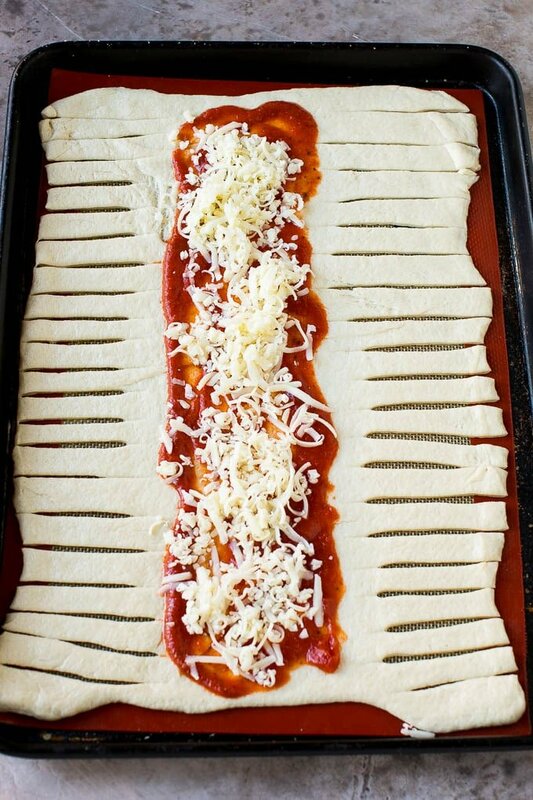 Cut 1/2 inch strips on the sides of the dough with a pizza cutter, then alternatively criss cross one strip of dough from each side to make a pattern, folding the edges over on the top and bottom of the stromboli. Brush the lightly beaten egg over the top and sides of the dough. Bake for 15-20 minutes or until stromboli is golden brown and cheese is melted. Top with chopped parsley if desired, cut into slices, and serve with marinara sauce for dipping. This is a sponsored post written by me on behalf of Smithfield. 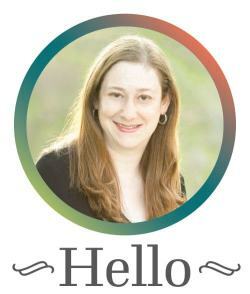 This post was originally published on September 12, 2016 and was updated on February 14, 2019 with new content. Wow, what a great idea!! Looks super delish!! I can’t wait to give it a go!! This looks like such a yummy and pretty recipe! I would love to try this recipe for my family. The difficulty level of this recipe seems a bit intermediate but I would like to make it on my own. Seems like a fun recipe! This would be fun to make! I would make a veggie version! Stromboli is one of my favorite meals ever! I’ve never made it myself though and I’m not sure why! Easy recipe! I love getting stromboli at our local restaurants, but I have never made my own. Your recipe looks like one that I absolutely must try my hand at soon. I think it’s one the whole family will enjoy very much! As a child I often ordered stromboli from our local pizza place, but I’ve never tried to make it myself. I appreciate all of the filling options and would add a little ricotta to mine. This looks delicious! Before this, I actually had no idea what a stromboli was, even though I have always heard of it (maybe on TV or in the movies? Im not actually sure….). I cant believe I’ve been missing out on this all my life .I need to try ASAP! This is great for me! You know why? My MIL makes breads like this, and I can’t ask her for her secret recipe, so now I have yours! Thanks a million! That looks so good! I can’t wait to make it. I’m going to be 100% honest right now. Before this, I thought Stromboli was just the mean circus guy that Pinnochio got involved with. The filling looks great. 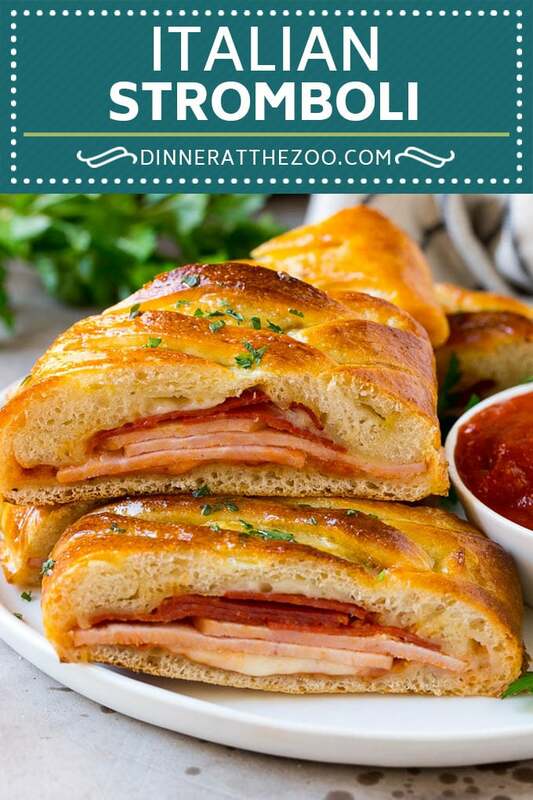 A ham and cheese stromboli is a fun idea! I love your tip about making a pattern with the dough! How is something so gorgeous so simple AND so delicious!? You’ve got a true triple threat here. Cannot wait to add this to the dinner menu! This looks delicious. The ham and melted cheese is a great combo. We always have leftover ham at holidays and I’m going to make this recipe with it! I love how it can be breakfast, lunch or dinner meal! I’m a fan of Smithfield hams and this recipe looks just perfect for my family! I have always loved Stromboli and this quick and easy version looks wonderful. 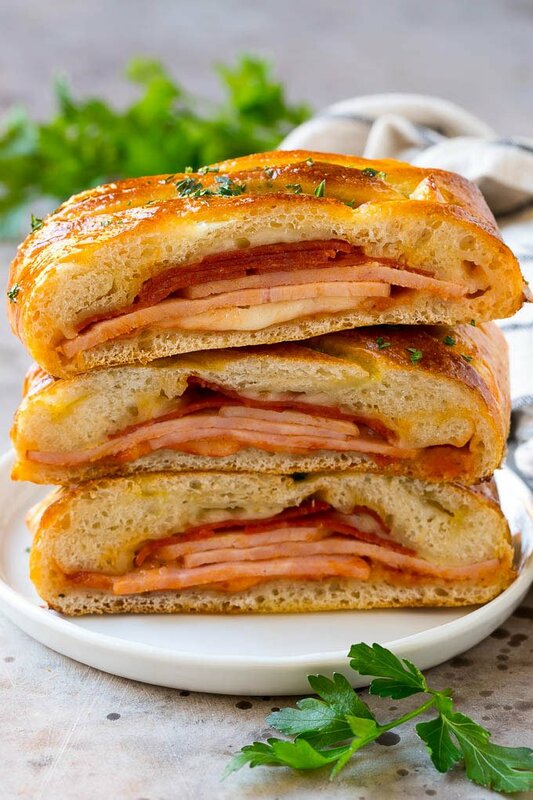 You can’t go wrong with ham, cheese and bread! Love that beautiful crust.